While you may not have heard about it since the ash isn’t grounding flights like the 2010 Eyjafjallajökull volcanic eruption, another volcano in Iceland is quietly and beautifully blowing its top – and a local photographer decided to go inside and take a look. The result - these mind-blowing images. According to the Iceland Review, the eruption of Holuhraun, a volcano in the Icelandic Highlands has been erupting since Aug. 29 and already covered seven square miles with lava, making it the largest lava eruption in Iceland since 1875. And it’s not slowing down; instead it’s progressing at a speed of 328 feet per hour. 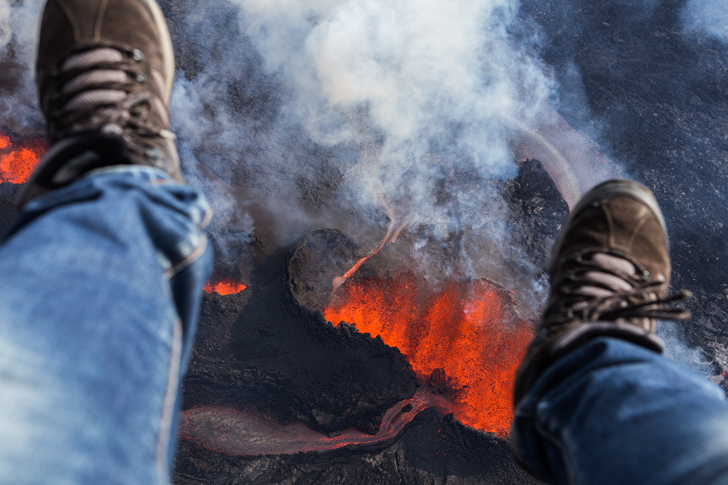 Icelandic photographer Iurie Belegurschi, co-founder of Guide to Iceland is definitely a daring dude because he decided to get up close and personal with Holuhraun, so close that he reports feeling the heat from the volcano on his skin. He took to the skies above the volcano via paraglider and came home with some incredible images that will no doubt stand the test of time. His images have the feel of something primordial, and show the essence of the Earth as being an orb filled with hot liquid and coated by a thin crust on which we precariously exist. Lava flow has been roughly four times more than the eruption at Eyjafjallajökull in 2010. Travel companies are waiting for the eruption to subside so they can offer tours to the area. The eruption is progressing at a speed of 328 feet per hour. The eruption is not sub-glacial so it has not produced enough ash to ground flights like the volcano in 2010. The eruption fissure is about three kilometers (1.86 miles) long. 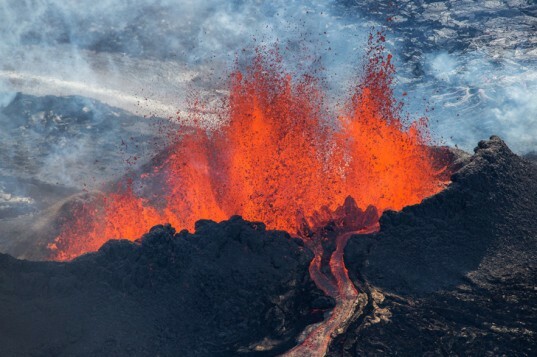 Holhuran is the largest eruption in Iceland since 1875.